I never know the difference between hay bales and straw bales. Aren't they the same thing? Anyway, these and several other monolithic bales are stacked up high at the corner of Albion Rd. and Leitrim Rd. in Ottawa. Who knows how much longer they'll be around before they get stored away. I would love to get someone to pose in front of one to get some sort of perspective on their hugiosity. I should have done a self-portrait, but who would want to see me. Straw is bigger diameter, less green, more orangy-yellow. Self-portrait next time you're by there? 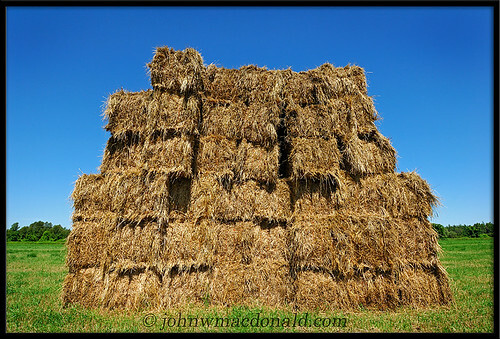 Straw is more for bedding, while hay is for feed. thanks for the clarification you both.